Everest – A.P. Youth on the Top of the World” – Orders – Issued.– Reg. The Special Commissioner of Youth Services has requested for according permission to the Special Commissioner (YS) for sanction of Rs.3.00 Cr. For taking up expedition to Mt. Everest as per the decision taken in the Apex Committee Meeting on Mission Mount Everest – 2018 held on Dt.12.10.2017 and to entrust the expedition to Ms. Transcend Adventures. 2. Government vide G.O. Rt. No.1492 Finance (FMU – GAD.II) Dt.27.06.2017 issued CBRO. Further the Special Commissioner of Youth Services has stated that the department is having sufficient budget under this scheme. Hence, permission is sought by the Special Commissioner of Youth Services for undertaking Mount Everest expedition with revised guidelines as approved by Apex Committee on 12.10.2017 and to incur an expenditure of Rs.3.00 Crores for sending 5 youth (1 SC, 1 ST, 1 Women and 2 others). 3. Government after careful examination of the proposal here accord permission to the Special Commissioner of Youth Services to incur an amount of Rs.3.00 (Rupees three crores only) for sending 5 youth 1 SC, 1 ST, 1 Women and 2 others) from out of the scheme budget available with them for the year 2017-18 under the Heads: “2204- Sports and Youth Services – MH 001 – Direction & Administration – GH11 - State Development Plan – (06) Youth Welfare Schemes – 500/503 – Other expenditure”, “2204-Sports & Youth Services - GH 11- State Development Plan – MH 796- Tribal Area Sub Plan – GH – State Development Plan – SH (05) Youth Welfare Schemes – 500/503 – Other Expenditure”. 4. The Special Commissioner of Youth Services shall take necessary action in the matter and give wide publicity to the programme to enable satisfactory response from youth in this state to afford them an opportunity for selection and to under go relevant training to experience thrill of adventure. Mt. Everest is located in the Mahalangur mountain range of Himalayas in Nepal and Tibet border. Its peak is 8,848metres (29,029 ft) above sea level. Most Nepali people refer this mountain as Sagarmatha, meaning "Forehead in the Sky. " Tibetans and Sherpa people refer it as “Qomolungma”, meaning "Goddess Mother of the World". To instill a sense of confidence and achievement in the hearts of youth. To create idols that can boost the morale of all the youth of Andhra Pradesh. To encourage youth of the State of Andhra Pradesh especially women to pursue adventure as profession and convert into career in adventure sports or adventure tourism. To provide domain of professionals to Adventure Tourism/activities in the state. To pitch the State of Andhra Pradesh on to the global adventure map. To encourage and empower un-employed youth of the state in Adventure tourism / Adventure activities. Mt. 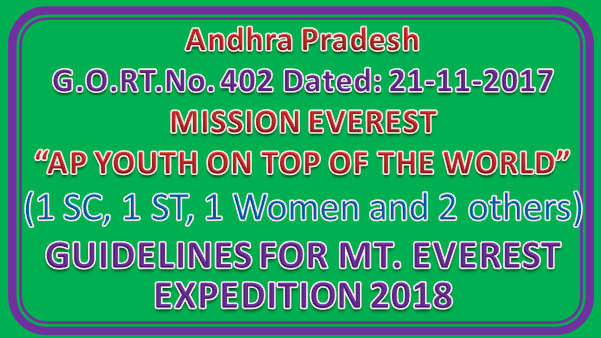 Everest climbing team will be consisting of five climbers selected from youth of State of the Andhra Pradesh. Out of Five youth one each reserved from SC, ST and Women and rest two will be open category. Preference will be given to woman, unemployed youth (who completed graduation) and orphan youth of the State of Andhra Pradesh. c. Born in the State of Andhra Pradesh. d. Studied in school / college / university in the State of Andhra Pradesh for four years continuously. The applicant should be between the age group of 21 – 35 years while applying. Annual income of the family from all sources of all the family members shall be less than Rs.81,000/- if the family resides in rural area and Rs.1,03,000/- if the family resides in municipal area. The family includes husband and / or wife and their unmarried children. The house hold supply card (white ration card) may be considered as one of the evidence of income. Speaking skills in English and Hindi language will be an added advantage for easy learning, training and interaction with Sherpas during the expedition. The Applicant should have completed graduation. Note: No limitations pertain to height. Application form duly filled in prescribed proforma. Medical Certificate shall be submitted in prescribed proforma duly signed by Government doctor (The aspiring youth shouldn’t have any history of nervous, breath, lungs or brain related illness). Photocopy of Aadhar card or Passport shall be submitted as address / residential proof. Date of Birth certificate or SSC marks memo shall be submitted as proof of age. Willingness of parents or guardian for participating in the expedition. Self attested copy of passing Graduation. Officers/Members to complete selection procedure and select best 10 youth from each district. experience in such programs) will be coordinating five days program. The Selected 40 students will be sent for undergoing Basic Mountaineering Course in Ministry of Defense recognized mountaineering institution. The institution shortlists best performed twenty youth. The selected 20 youth team will be sent for Advance Mountaineering Course in mountaineering institution recognized by Ministry of Defense. The institution shortlists best performed Nine youth. For the selected team of 9 youth, physical fitness enhancement will be done along with mental conditioning at ground level. The team will be trained in advanced techniques of climbing and safety equipment. This would be for one month under supervision of expedition leader. The team of Nine (9) will be taken to Himalayas for winter training to test their endurance and cold bearing capacity, as they have to bare extreme cold and extreme weather conditions while climbing Mt. Everest. Indian Army officer, rank of Lt Col or above (who climbed Mt Everest earlier) will be taken along with the team to select the final five member team depending on their performance during this expedition. Expedition leader and doctor will also accompany the team. The final selected team of 5 youth will be trained in technical and various other skills required for climbing Mt. Everest like using artificial oxygen etc... by expedition leader for three months. Mount Everest is the highest mountain in the world and attempting to climb it still continues to be one of the most dangerous of human pursuits. To take up such challenge and bringing team back safely, experienced leader of the expedition is very important.